Arrowgrass (Triglochin maritima) is a perennial, grass-like plant which is native to North America, South America, Europe and parts of Asia. Arrowgrass grows in shallow, brackish to freshwater marshes, road ditches, open wet prairies, tidal marshes, edges of wetlands and springs. Arrowgrass is of the Juncaginaceae plant family and starts growing in early spring. Arrowgrass is more toxic when stressed or damaged due to frost, wilting, stunting or physical damage (mowing, chopping, etc). Plants lose their toxicity with drying. Highest concentrations of poison are in newly developing leaves and during and just after a drought. Arrowgrass growing under drought conditions has been found to be 5 to 10 times as toxic as those plants that have been partially submerged throughout the entire growing season. Death occurs within minutes of ingestion. Flowers: 100+ short-stalked small, green flowers along a stout, naked stem in a narrow, spike-like raceme. Later the flowers turn into golden-brown fruits. Leaves: Dark green, toothless, hairless, erect to ascending, mostly basal, blunt or pointed at the tip. When crushed, they produce a musky skunk-like odor (what cyanide smells like). Stems: Flowering stems are smooth and often reddish to purple in color. Fruit: Green to golden-brown, oblong, and divided into six evident carpels. 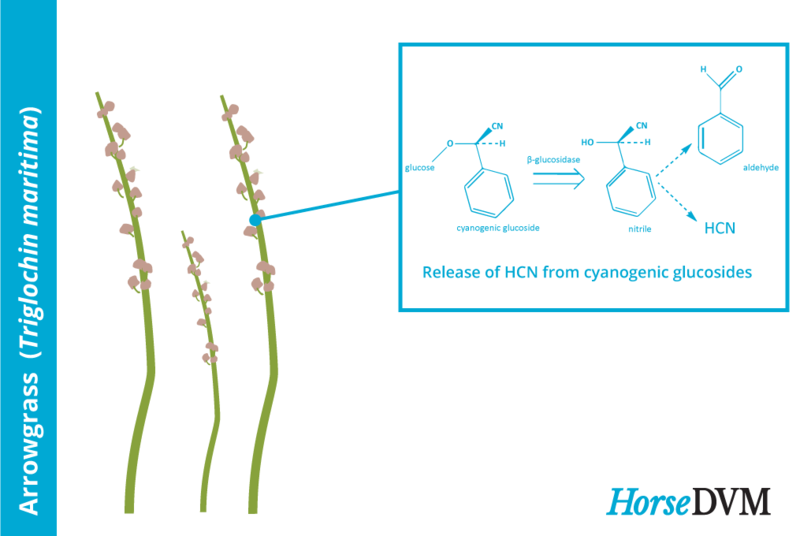 CHEMICAL CONTROL: Arrowgrass can be controlled with 1–3 lb glyphosphate per acre 2% solution glyphosphate, spray to wet. Applied anytime during growing season. 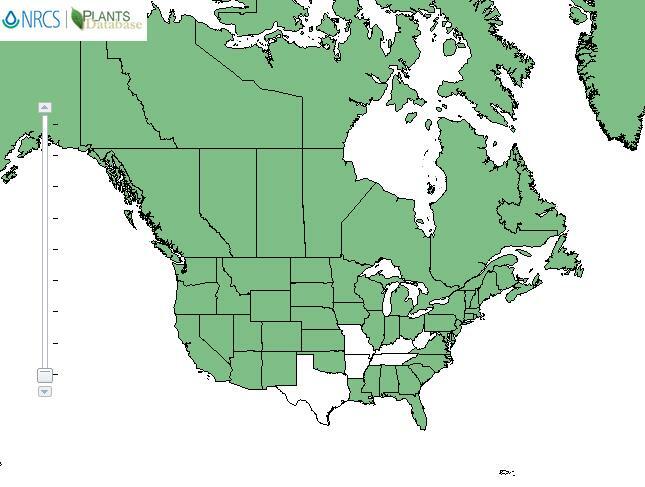 USDA Arrowgrass (Triglochin maritima and T. palustris) headline bar Poisonous Plant Research Database. 2018. S Robinson Common Weeds Poisonous to Grazing Livestock Ontario Ministry of Agriculture, Food and Rural Affairs. 2011. United States Department of Agriculture (USDA) Plans Poisonous to Livestock in the Western States Agriculture Information Bulletin Number 415. 2011. Jackson T. Cyanide poisoning in two donkeys. Veterinary Human Toxicology. 1995. Beath, O. A.; Draize, J. H.; Eppson, H. F. Arrow grass, chemical and physiological considerations. Wyoming Agric Exp Sta Bull, #193 1-36. 1933. Marsh, C. D.; Clawson, A. B.; Roe, G. C. Arrow grass (Triglochin maritima) as a stock-poisoning plant. U S Dep Agric Tech Bull, #113 1-14. 1929.